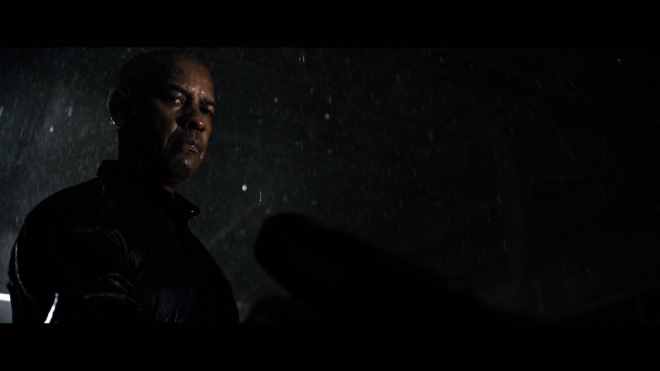 Antoine Fuqua's 2014 vigilante thriller The Equalizer remains a terrifically engaging actioner with an excellent performance by Denzel Washington as the titular character who chooses to apply his deadly skills to help others as part of his road to redemption. This 4K Ultra HD Blu-ray evens the odds with an excellent 4K HDR10 presentation, an even better Dolby Atmos soundtrack, and the same set of supplements as before, making the package Worth a Look for fans and UHD enthusiasts. Following the trend of proving to the world that age is only a number, Denzel Washington has, in the last fifteen years, been making a move into the action genre, and Antoine Fuqua's 2014 vigilante thriller The Equalizer should rank as one of the award-winning actor's more memorable roles since this shift into new and interesting territories. Washington is better known for his dramatic performances with a few sci-fi features and more straightforward thrillers sprinkled throughout his four-decade career, but lately, he's been bringing those theatrical talents into more traditionally heroic portrayals, adding an unexpected level of gravity and poignancy not often seen in the genre. The Book of Eli and Man on Fire are great examples of this, and Washington's Robert McCall is yet another surprising performance that elevates Fuqua's film beyond the plot's simple, B-movie trappings. On its own, this type of sordid, exploitation pulp is to my liking, but as they did with Training Day, an otherwise throwaway feature is remarkably engaging and memorable. Based on the 1980s television crime drama, Richard Wenk's script follows Washington's former black ops agent McCall attempting to live a quiet life, working as a retail clerk at a hardware store and discussing classic literature with troubled teen Alina (Chloë Grace Moretz). Essentially, the action flick is similar to a pilot episode where audiences are introduced to a generously friendly stranger with a mysterious past. For the first half of the film, we're kept in the dark and very slowly learn more. 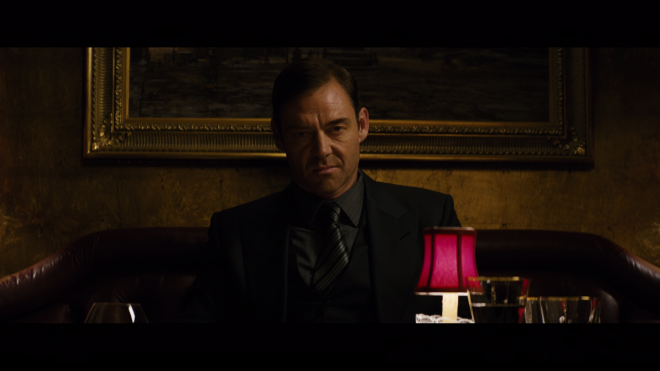 As he infiltrates the crime business of the Russian mafia and its deadly enforcer Nicolai Itchenko (Marton Csokas), we pick up clues of an earlier life he'd much rather forget, that he was a skillful combat fighter with a talent for killing and has friends in high government places (Melissa Leo and Bill Pullman). This makes for a highly-engaging action thriller, and Fuqua does terrifically behind the camera, maintaining interest and intrigue, though the choppy, fast-paced editing turns fighting sequences into a blur. Nevertheless, the movie is one of the better actioners of late. For a more in-depth take on the movie, you can read our review of the Blu-ray HERE. 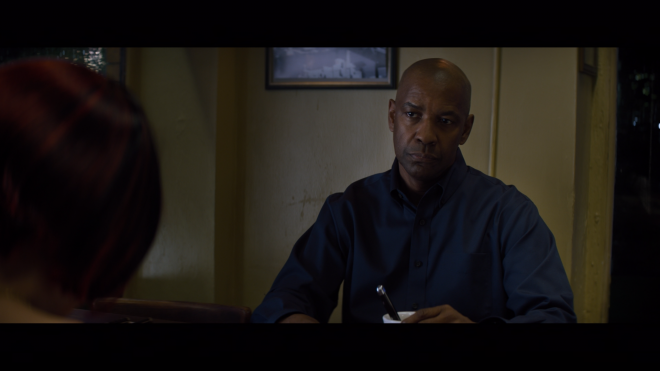 Sony Pictures Home Entertainment brings The Equalizer to 4K Ultra HD Blu-ray as a two-disc combo pack with a Digital Copy code. Said code can be redeemed via SonyPictures.com, MoviesAnywhere and VUDU, giving users access to the 1080p HD with 5.1 Dolby Digital Plus. Inside the black, eco-vortex case with glossy slipcover, the triple-layered UHD100 disc sits comfortably opposite a Region Free, BD50 copy. At startup, the disc goes straight to an interactive main menu that changes screens when switching between the usual options while music plays in the background. Washington evens the odds on 4K Ultra HD with a great-looking HEVC H.265 encode, showing excellent detailing in nearly every scene. Occasionally, a few moments are a tad softer than others with negligible instances of minor aliasing along the sharpest edges, but on the whole, the picture is sharp with well-defined lines in the clothing, buildings and various objects in the background. Pores, wrinkles and blemishes are distinct for the most part, but once in a while, some sequences can appear as though the result of mild digital manipulation, making faces a bit too smooth and somewhat waxy, such as McCall's confrontation with Slavi. Thankfully, it's nothing terribly egregious or distracting while black levels remain inky rich and pure, showering the scene with oily, pitch-black shadows that provide the 2.39:1 image with welcomed dimensionality. However, there are also times when those shadows can consume the finer details or are only of one shade, as in the clothing worn by McCall or the dark nighttime exteriors. Vigilante justice hits hard and loud with an excellent Dolby Atmos soundtrack offering a welcomed upgrade over it's DTS-HD MA predecessor. For a majority of the time, the action is focused across the fronts, revealing terrific balance and fluid movement between the three channels with a several ambient noises traveling into the top heights, generating a broad and highly-engaging soundstage. But there is also a good deal of activity in the rears with various atmospherics panning around the listening area during the many fighting sequences, providing a satisfyingly immersive soundfield. Bits of debris and water from fire sprinklers can be heard pouring from above and all around the listener, and the noise of subway trains and helicopters flying in the air also discretely travel across the overhead speakers with amusing effectiveness, creating a fantastically hemispheric experience. All of the same supplements are ported over from previous home video release, which can be read in more detail in our review of the standard Blu-ray HERE, but for this 4K edition, Sony Pictures has added a few more bonus features exclusive to this version, further tempting owners to upgrade. Playing the Part (HD, 5 min): Interviews on the three central protagonists and personalities. The Home Mart Advantage (HD, 5 min): Closer look on the action sequences and fight choreography. A Villain's Psychosis (HD, 4 min): Piece centered around Marton Csokas' character and performance. A Modern Hero (HD, 2 min): Much of the same but now on the titular hero and personality traits. Deleted Scenes (HD, 6 min): Five excised scenes. Trailers (HD): A pair of theatrical trailers. 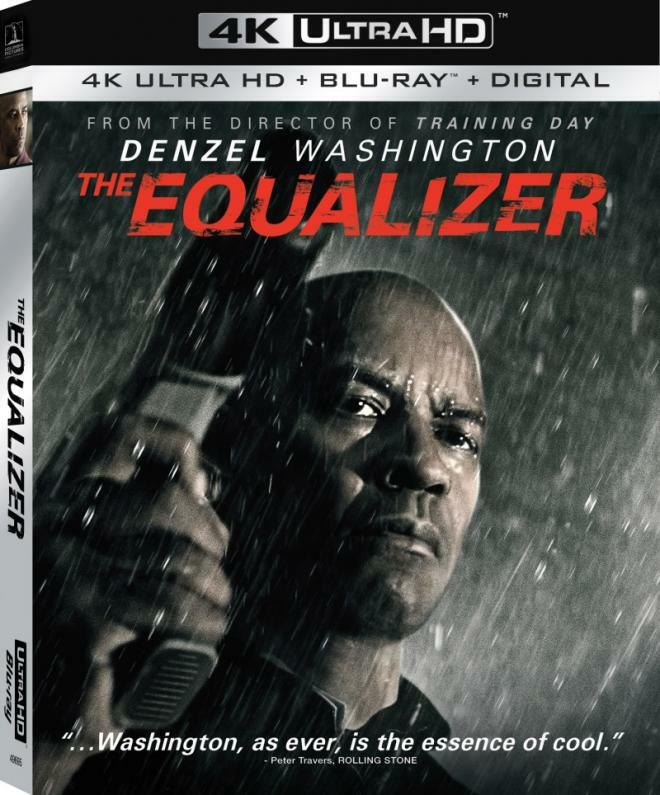 In The Equalizer, Denzel Washington delivers a memorable performance as the titular character with a mysterious past who helps Chloë Grace Moretz change her life and infiltrates the Russian mafia along the way. Antoine Fuqua's 2014 vigilante thriller is engaging and thrilling, exceeding the plot's B-movie trappings by focusing on Washington's portrayal of a reluctant hero desiring peace but discovers his road to redemption instead. The film evens the odds on Ultra HD with an excellent 4K HDR10 presentation offering a welcomed improvement over its HD counterpart and a satisfyingly immersive Dolby Atmos soundtrack. Porting over the same set of supplements as the Blu-ray, the overall package is worth a look for established fans and those hungry for more HDR goodness.